Hawai‘i Volcanoes National Park protects 520 square miles on the southeast side of the Big Island of Hawai‘i. The park is a place of wonder to explore, containing two of the most active Volcanoes on the planet, Mauna Loa and Kīlauea. Mauna Loa is 13,677 feet tall, one of the world’s largest volcanoes – only slightly shorter than Moana Kea, the biggest volcano on the Big Island. Large lava flows covered land southeast of the park destroying over 700 homes and devastating residential areas in the Puna District. At the same time, the summit area of the park was dramatically changed by tens of thousands of earthquakes, towering ash plumes, and 62 massive collapse explosions. The events caused profound damage to park infrastructure unprecedented in the park’s 102 year history including building damage, rock falls, deep cracks in roads and trails, and numerous breaks to water and sewer lines. 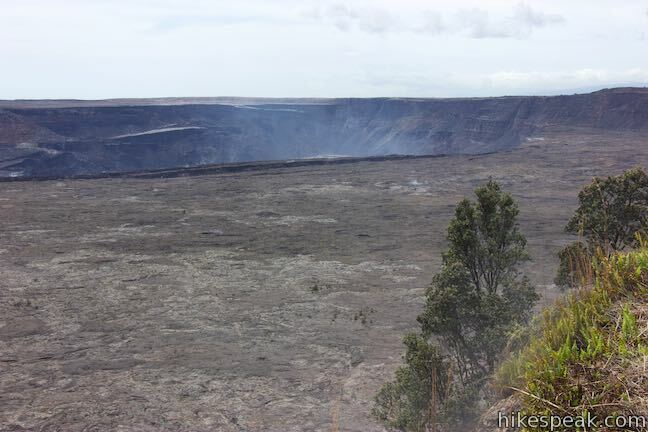 The Halemaʻumaʻu crater at the center of Kīlauea changed remarkably during the eruption. The crater is 1,600 feet deeper than it was before 2018 (as a reference, the Empire State Building is 1,450 feet tall). The crater grew in volume from about 60 million cubic yards to 1.2 billion cubic yards. The National Park Service has shared incredible before and after photos showing just how much Kīlauea changed. Because Hawai‘i Volcanoes National Park is such a dynamic place, park conditions may impact your itinereary. Check for updates before your visit and stop by the Kīlauea Visitor Center (next to the park entrance) when you arrive to get current closure information and recommendations. This is a great park to explore by car and on foot. Kīlauea Caldera is the main attraction, with a Steaming Bluff along its edges and a massive crater to look in upon. Kīlauea is visible from overlooks along Crater Rim Drive (which is no longer open as a full loop) and adjacent hiking trails. Chain of Craters Road descends toward the park’s coast, passing hardened lava flows and craters. The road ends at Hōlei Sea Arch, a thrilling basalt formation. Just up the road, Pu‘u Loa Trail leads to the largest petroglyph field in Hawai‘i. 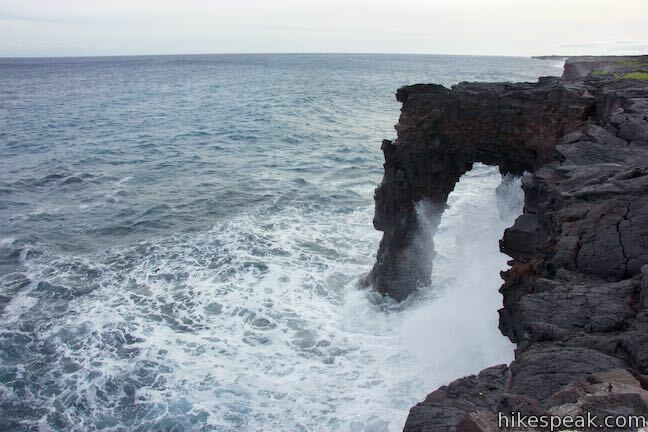 This brief hike crosses a basalt bluff to a landmark sea arch extending into the ocean. This 1.4-mile hike traverses an old lava flow to a boardwalk loop within a special area of preserved petroglyphs.